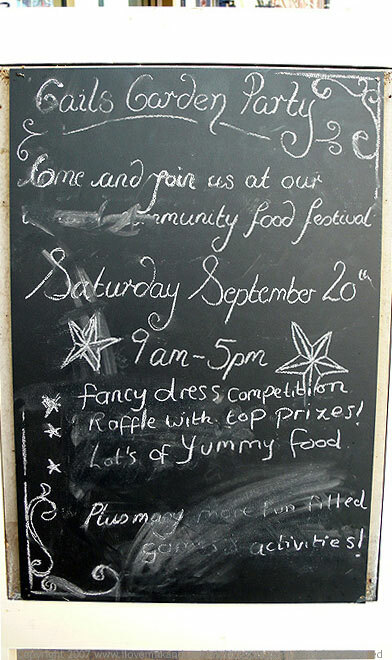 The invitation's a little smudged but you get the gist. Just follow the smell of baking bread. Can a garden party without an actual garden, in fact be called a garden party? Well, I'm not sure if the small patch of grass along the laneway where the Gail's Bakery party took place could be considered a garden but nonetheless, the amount of cakes and pastries made up for the lack of greenery. Gail's Garden Party, held annually in Hampstead was every carb lover's dream, with enough cakes, sandwiches, breads and sweets to make your blood sugar curdle. 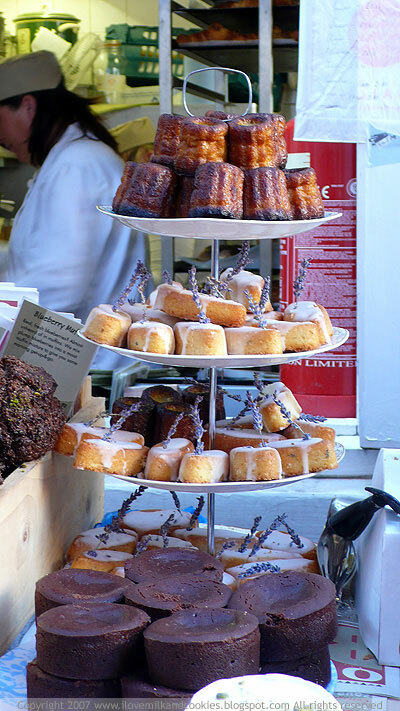 A tower of delight- cannelles, iced lavender and almond cake and some flourless chocolate cakes in the foreground. 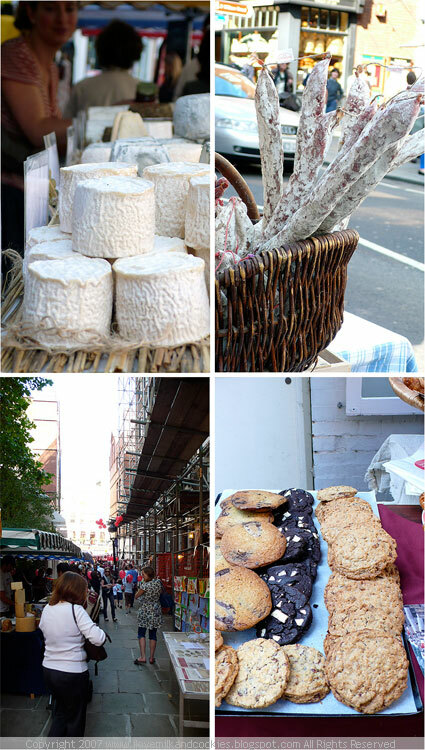 There was the chilli chutney stand, Spanish chorizo and exotic sausages and the odd cheese stall peppered throughout, namely the iconic Neal's Yard Dairy, however most of the focus was on Gail's magnificent selection of baked goods. There was more flour and sugar in this one narrow laneway than you could shake a stick at. I was in my element. 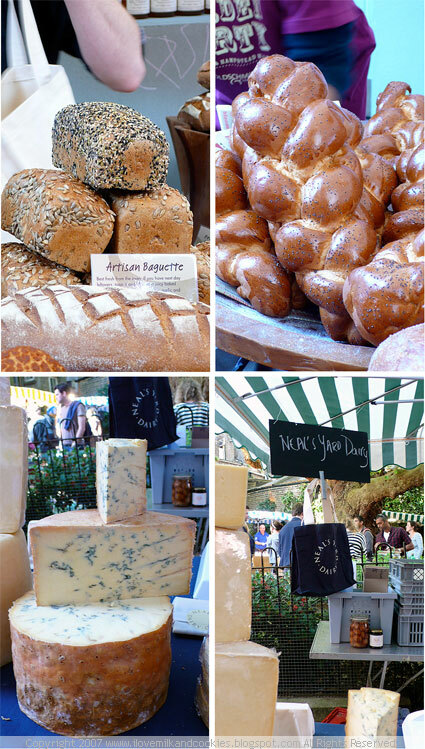 Multigrain and artisan loaves; beautifully glazed challah bread; Neal's Yard Dairy stall; blue vein cheese. 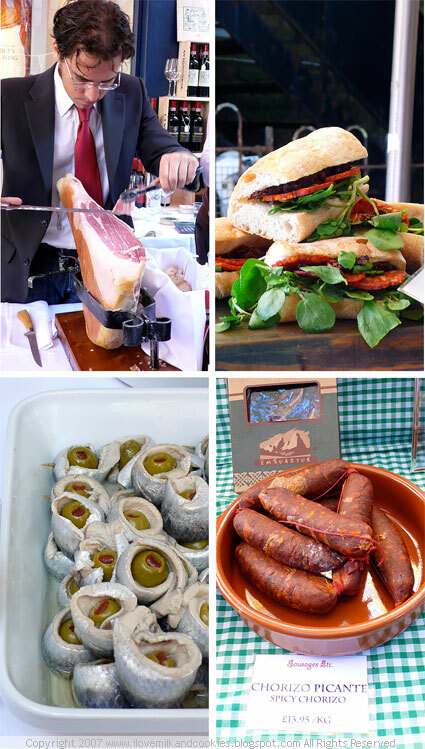 Precision slicing of jamon; panini central; chorizo picante for those who like it hot; stuffed green olives wrapped in sardines. 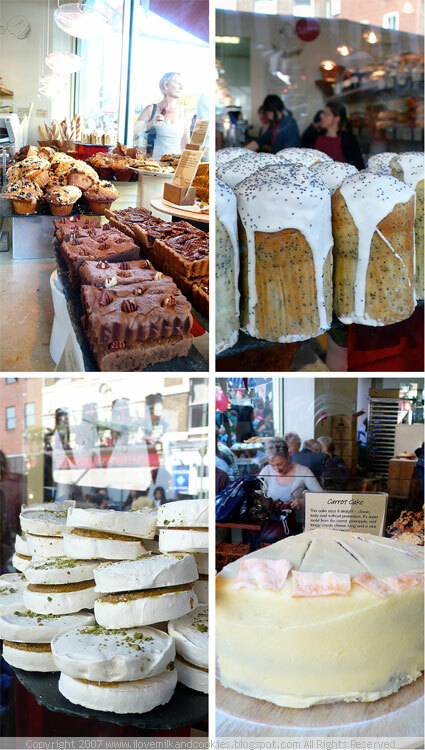 Slices, muffins and bread sticks, all part of the enticing window display at Gail's Hampstead; orange and poppyseed cakes; classic carrot cake; pistachio filled meringue. With a grin from ear to ear I made my way through stall after stall of goodies to ease that grumbling tummy. 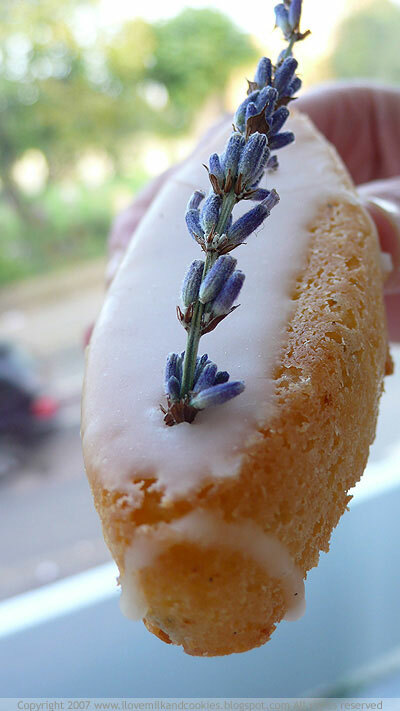 After a sun-dried tomato sandwich and some cheese, I decided on some iced lavender and almond cakes and a couple of incredibly beautiful cannelles- my new vice. 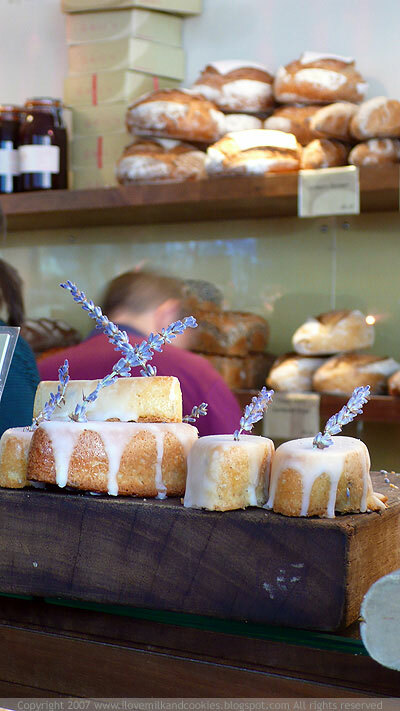 Front counter goodies- iced lavender and almond cakes, beautifully moist and aromatic. I have never come across cannelles being sold at bakeries in Sydney, so seeing so many around and about London really is a novelty. My first taste were at the Borough Markets, 3 cannelles for a pound; they were delicious, a little chewy, but for my first ever cannelles I didn't know what to expect. The cannelles at Gail's were a little bit more spongey and light, less chewy and more airy. So I'm not sure which one is more authentic, or whether they are both, all I know is I'm happy to be polishing off either one right now. Gail's cannelles were soft, light and airy, and not to mention incredibly moreish. 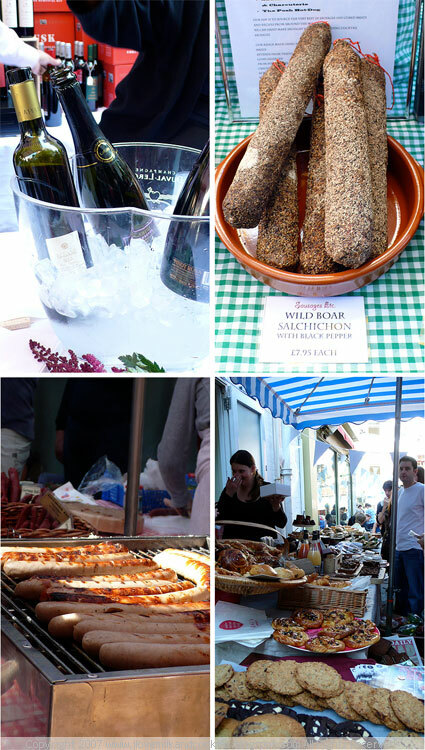 It's not a party without a bit of booze, wild boar salchichon; cookies, pastries and quiches at the outdoor Gail's stand; German sausage sizzle. You can still call it a garden party, no worries :0) But I'D just call it a FABULOUSLY DELICIOUS party!! as soon as I saw the photo of the cannelles I thought, yum, where can I get those in Sydney. They are a hassle to make. I know where there are some good ones in SF. My mouth actually just watered! These pictures make my breakfast of granary toast and Earl Grey seem very, very boring! 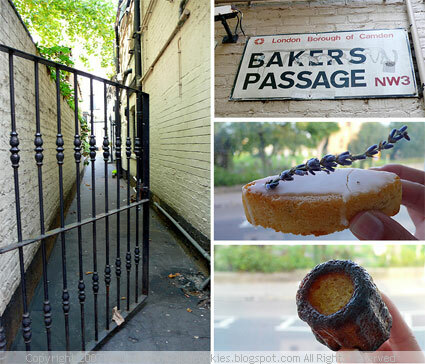 I must visit that bakery next time i am in London! Are you enjoying being there so far? We were at the same place at the same time. Amazing. And also a bit crazy. Are you still in London? Oh wow it all looks fantastic! I'm green with envy. I don't manage to get down to London very often and your posts are making me so jealous. Veggie Girl- I have to agree with you, definitely a party with all that food! Hopie- Yes, the only way to give that ham the respect it deserves is to dress accordingly, and that guy did just that! Debbie Ann- I know, I have always wanted to make my own cannelles, but never could find the bees wax, and the moulds are also quite pricey. I've never seen them being sold in Sydney but if you ever happen upon some, please let me know. Lisa-Marie- Oh yes Gail's is definitely a top-notch find in London and you must visit whenever you are here. Shuna Fish Lydon- wow, so you were there too. We could have bumped into each other and never knew it! Katie- Yes, it was a great day out, I must say. 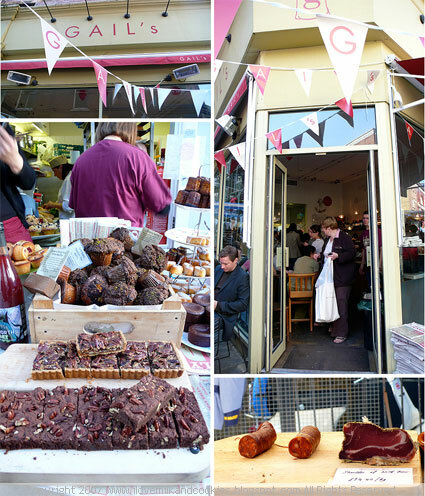 Next time you are in town check out Gail's and perhaps we could go in for a spot of tea and cakes! OMG I am so hungry! I wish I had a recipie for those Lavedar Almond things!!! Next time you go, try their pain au raisins, they're particularly good. these pictures make me miss london so bad, its not even funny. - will be back & cant wait to meet up! these are absolutely beautiful jen! thanks for sharing! lordy those pictures are amazingly fabulous! i want a man in a suit to slice me ham. i want him right now! i would like to be there in that heaven!!! Foooooood! I want it all! Oh my goodness, I have to confess that your pictures are so beautiful I dragged one off of your site and have it as the background of my computer. It makes me hungry every time I turn on the screen. Good grief, my heart is pounding after that post! This looks like my number one food destination right now. Those giant poppyseed muffins look absolutely amazing! I am drooling in my morning coffee. Torturing me, you are. Wow! How I wish I had known about this, I would have been there in a flash! It looks amazing, the cannelles look delicious. All that bread and cheese is also giving me serious food envy..
i adore gail's! i lived near that very one during the summer when on a work placement and had to use so much restraint not to treat myself too often. i wish i was there for the garden party. everything looks so exquisite. brilliant photos! These pictures are beautiful. Which type of camera do you use? i can't get over how great those pictures look - and the food in the pictures, of course. Wow!! I want a piece of everything!! ooo jen.. where have u been? i miss ur pretty food postings and polka dots.. when will u post again? These pictures are delectable. Makes one want to start baking and eating in beautiful and large amounts. what a beautiful party, these pictures are absolutely beautiful. Oh, those cannelles look so good. I want one right now.